Our Woburn Foyer is a great space for exhibitions and receptions. The space comes included in Main Hall bookings and is the perfect space for registering your attendees and arrival refreshments being situated opposite our reception and just outside the Main Hall. The space works perfectly for catering for Main Hall events if numbers are 80 or less for theatre style bookings and 100 or less for cabaret style bookings. The Woburn Foyer also works really well for post event drinks receptions with lots of daylight and views out onto the hustle and bustle of Upper Woburn Place. The space comes with a 42" LCD screen which can be used for showing promotional videos or presentations and PA system for speaches or background music. 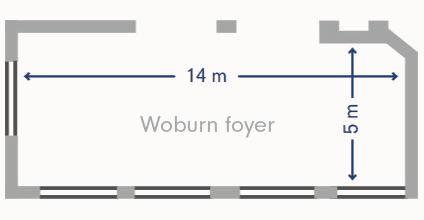 The Foyer dimensions are 5 x 14 metres (LxW). Woburn House Conference Centre Ltd is owned by Universities UK. Registered Office: 20 - 24 Tavistock Square, London, WC1H 9HQ. Registered in England and Wales Company No 3031467. Site by Effusion. Woburn House Update, food, Christmas, special offers and more!